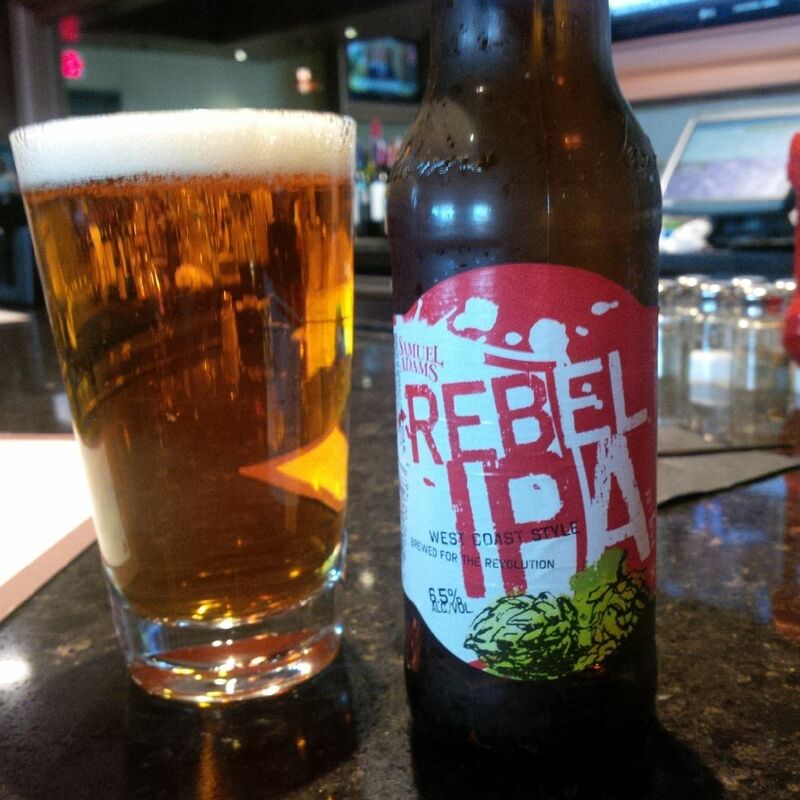 There was an endless variety in local beer stores, Nikki’s was particularly impressive. My tastings were restricted to what I am interested in, therefore the range might seem narrow. I didn’t select flavoured beers, gose, saison or sours, for example, as I generally don’t drink these. I did try a local hefeweizen, in a flight called “local taste”, and it was good, correct in style. I like strong and Imperial stout and when in the States buy, i) domestic examples if they meet my interests (small-size bottles, not flavoured), or ii) well-regarded imports. See the beers pictured below which are old-school, Sinebrychoff has had a brewery in Finland since the 1800’s. Guinness of course needs no introduction. I saw Carnegie Porter, and Le Coq’s Imperial Extra Double Stout from Harvey, but just didn’t have the time to taste these. The Sinebrychoff unfortunately was (for me) too old, probably 4-5 years old although it was hard to tell from the bottle. A little too winy and soy-like, that is. 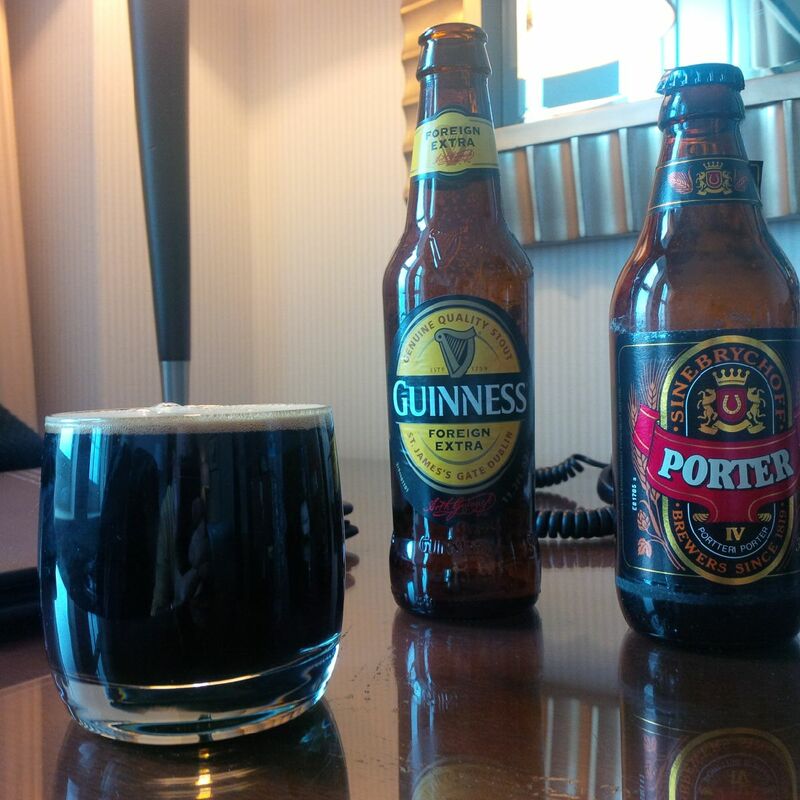 The Guinness FES was excellent, very fresh and full-tasting. The beer does seem to change a bit over time and seems to have more character than 5 years ago. I couldn’t find the new porters Guinness has introduced in recent years especially West Indies Porter. Guinness might use some kind of food grade acid today to lend the tart note to FES and I think I could detect it, but it’s still an excellent beer. Anchor’s Great Cloud Stout was halfway in character between the two beers above and quite good although again, not as fresh as I would like. One always takes that risk when buying beers from far away. That doesn’t mean local beers are always better, in one brewpub a kolsch-style seemed clearly damp paper-oxidized. A Grand Imperial Porter from Amber Brewery in Poland was very good and a great value ($2.00 plus for a tall bottle), sweet but that is typical of most Polish porters. It gets a deservedly high score on Ratebeer. 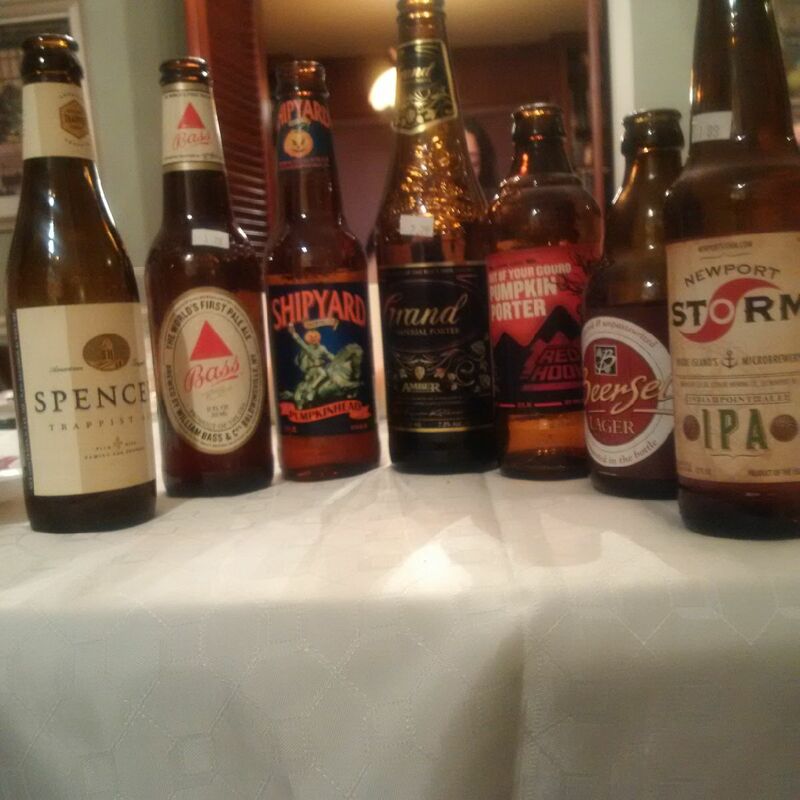 (The Grand Porter is in centre, sorry for poor image quality). In terms of IPA, I had two very good, local ones: Newport’s Storm IPA and Revival Burnsider Pale Ale. The Storm IPA is as good as they come, big flavours but all cohering. The other had an orangey colour and English-type malt taste, with well-modulated American hopping, and just a touch of fruity vinegar. This latter technically might be a fault, but I liked the beer a lot. Good old Bass Ale was fresh and good, it benefits from being brewed now in the New York State, and has the typical apple muffin taste. In pumpkin beers, Southern Tier’s Pumking on draft proved to me it is still the best out there, with a characteristic pumpkin pureé flavour. 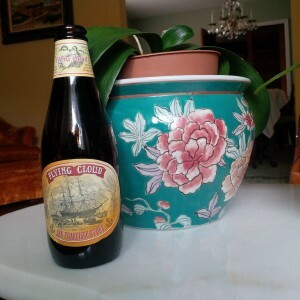 Shipyard’s shown above was good although it overdoes the spicy element IMO. Redhook’s Out Of Your Gourd Pumpkin Porter was an excellent blend of pumpkin and stout flavours but I think I could detect roasted barley, and prefer porter and stout all-malt, but it’s still a good beer. (Idea for a great “four threads” pumpkin porter: 50% Grand Imperial Porter (the mild), 30% FES (the medium-aged), 15% Shipyard Pumpkin Ale (the spice), 5% Sinebrychoff porter (the extra-aged). I like it so the pumpkin pie element is just an undertone. Got all that?). Spencer Trappist Ale, from the new American Trappist brewery, tasted cidery and gushed on opening. I could taste the Belgian yeast strain and some New World hops as well. Disappointing, but new breweries often need a gestation period to sustain technical stability; I’m sure in time it will improve. Magic Hat IPL (India Pale Lager) was great, I’d like to have had a pint but had to be satisfied with a few ounces. It’s one of those beers that taste great without being super-busy in flavours, but you need an (English) pint measure to really get this kind of beer. Given the Boston connection, I couldn’t pass up Sam Adams Boston Lager and Rebel IPA. Very good both with full hoppy tastes, correct and good flavours. It annoys me that Sam Adams Boston Ale was hard to find, even in an area adjacent to the Boston heartland. And it’s one of their best beers. Trinity Brewhouse in Providence disappointed on this trip but I’ll revisit in the future, sometimes beers just don’t taste right for whatever reason. Didn’t get the chance to visit the other longstanding brewpub downtown, in the former railroad station. One of my favourites was Narragansett Innsmouth Olde Ale, this had an intriguing, aged dark ale character without being tart or oxidized, it was more English than American although I couldn’t really place it. I saw a 4 pack in the stores for relatively little but didn’t buy it as I was at my duty-free limit. This is a winner and I hope will stay in the market. Coda: In one of the stores, I noted Ballantine India Pale Ale wasn’t available. The clerk said it was in stock earlier but wasn’t reordered since it didn’t move quickly enough. I mentioned that in the 1970’s it was brewed in Cranston, R.I. and was a legendary, pre-craft New England beer that inspired the hundreds of IPAs on the shelves. Reaction was nonchalant, but that’s okay: time moves on, people forget and the brand had been out of the market for 20 years. Still, a good little moment whose irony I could savour me myself and I.